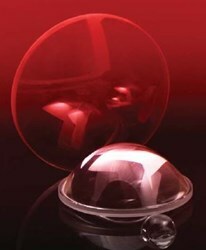 Aspherical lenses, or aspheres, are typically used in high efficiency illumination systems due to their shorter focal length and correction for spherical and coma aberrations. These characteristics result in better overall image quality. Aspheres simplify the systems that they’re integrated into by creating a larger aperture for the optical path and mechanical structure. The result is a brighter image and performance improvements in camera lenses, viewfinders, TV camera tubes, fiber optic connectors, medical equipment, and more. To learn more about the benefits of aspherical lenses, download the datasheet. You can also contact Ross Optical directly for more information or to discuss your potential application.